The Russian Federation has been regularly committing violations of Ukraine’s airspace by launching reconnaisance UAVs over the Ukrainian territory. 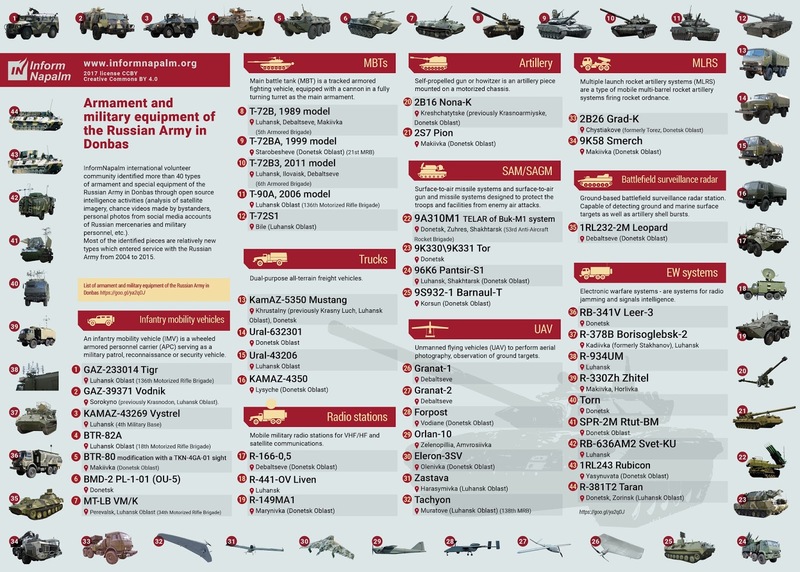 In 2014–2017, InformNapalm volunteers collected the evidence of the use of at least seven types of Russian UAVs by Russia against Ukraine. They include Granat-1, Granat-2, Forpost, Eleron-3SV, Zastava, Tachion, and Orlan-10. The last model is encountered most often in the evidence list because the range of applications of the Russian Orlan-10 multipurpose UAV is relatively broad. It is capable of not only target and terrain reconnaissance, but can also operate as a part of the Russian Army’s RB-341V LEER-3 EW system for the suppression of ground-based communication facilities. This system has been spotted a number of times in the occupied territory of the Donbas. The volunteers of Army SOS have provided exclusive evidence of multiple violations of Ukraine’s airspace by the Russian Federation. The volunteers’ report is based on the decrypted data from the flash drive of Russia’s Orlan-10 UAV, tail number 10332. This vehicle crashed into the Sea of Azov on November 6, 2016, near the village of Melekine (Pervomaisk Rayon of Donetsk Oblast). The UAV’s flight logs show that it has flown numerous reconnaissance missions over the Ukrainian territory since 2014. According to the report, the Russian UAV has been in active use since the Crimea occupation operation. It also flew reconnaissance missions near the Ukrainian villages and cities of Berdianske, Vynohradne, Kalynivka, Lebedynske, Mariupol, Pokrovske, Prymorske, Pionerske, Sopyne, Sartana, Sakhanka, Talakivka, and Shyrokyne. The UAH was launched from sites in the occupied Crimea, and from the Russian Army’s training ranges in Krasnodar Krai and Volgograd Oblast. Please refer to the infographics based on InformNapalm investigation database.